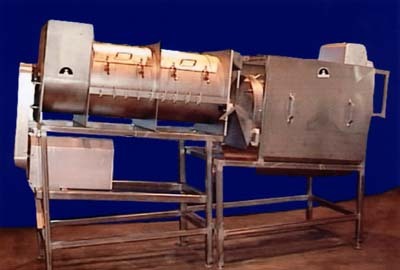 All parts are fabricated from stainless steel and food-grade materials. The drive system is electric, with hydraulic or gas engine system. Individual mussels transfer to the grader section, which contains precisely spaced rods through which spat and small mussels pass and are separated from the desired mussels. Gentle separation of mussels is achieved by the use of rotary blades and stationary rods in combination with our unique over-the-door discharge gate. Unlike auger and fixed discharges, this system allows for a continuous controlled discharge of the mussels, with no breakage or clogging. *Above leasing prices based on 60 month term/10% end of lease option. Prices exclusive of currency, taxes and shipping fees. Lease subject to credit approval. There are three sizes of debyssers available. Series 300 with a production rate of 3000lbs/hr is desifned to accommodate the large-scale processor, series 100 and 200 with production rates of 1000lbs/hr and 1500lbs/hr are more suited to individual growers and mid-sized plants whose production requirements are not as heavy as that of a large processing plant. Fabricated from food grade stainless steel and plastic material and the chain, sprockets and knurled rods are easily accessible for cleaning and maintenance purposes. 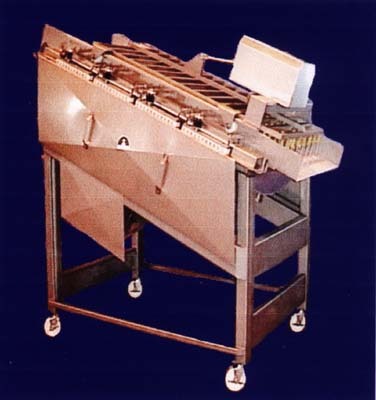 Designed to gently remove the byssel thread with minimum stress to the mussel, these units can be feed manually or by a speed-controlled hopper conveyor. The debyssers are electrically driven or, optionally, the units can be driven by hydraulics.